Two Port Alberni dragonboaters will be hoping to bring home gold for Canada at the world championships in Adelaide next month. Mar. 24, 2016 2:00 p.m.
Two Port Alberni athletes will be among a group of close to 100 dragonboaters hoping to bring home gold for Canada at the world championships in Adelaide, South Australia next month. Maggi Slassor and Marilyn Oldfield are competing as part of the Gorging Dragon Seniors team from Victoria—one of only five teams in their age bracket nationwide to compete in the worlds. “Our team qualified in the nationals in Welland, ON, last June in order to compete in the worlds,” said Slassor. Their team is part of the Vancouver Island Paddling Club. “We train in Victoria, our boats are in Victoria but we’ve got paddlers from as far as Port McNeill and Nelson. There’s about 10 from up-Island,” said Slassor. 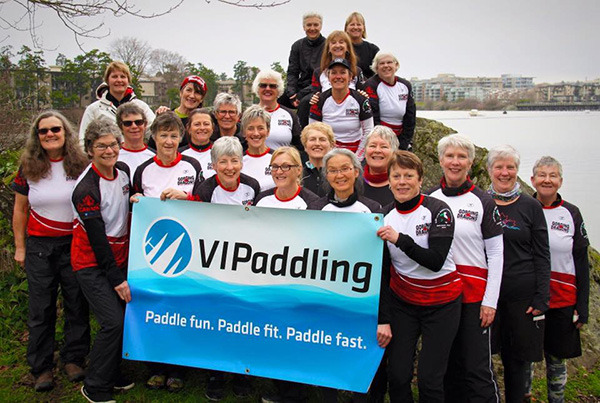 VI Paddling has an invitation for four senior’s teams—Slassor and Oldfield are competing in the 60-plus women’s category. It won’t be the club’s first trip to the world championship. “This club went to Italy in 2014 and the Senior C women’s team won a bronze and a silver medal there,” said Slassor. These will be Slassor’s first world championships but Oldfield’s 20th anniversary since her trip to the worlds. “I’ve been paddling since about 1994 and I was lucky enough in 1996 to go to a world competition to Hawaii,” Oldfield said. Oldfield originally got into the sport when she was living in Vancouver and working at the Royal Bank. Both women have paddled with the local West Coast Dragon Boat Society Club for years. “We paddled here recreationally and then stepped it up a notch and joined a seniors team,” Oldfield said. After taking home gold at the seniors games, they moved on up to the Gorging Dragons and now the Club Crew world championships. For Slassor, it’s only been a year since she first joined the team. “I’ve been part of this team since last March,” she said. Slassor has been dragonboating recreationally since 2007 but has a lifetime of watersports to draw on. “I sail, I canoe, I kayak so for me paddling is a lifestyle and dragonboating was just another thing where as soon as I had the time to try it out, I jumped in the boat,” said Slassor. Both women agree that it’s an easy sport to get sucked into. “It’s very addicting,” said Oldfield. But the level of training is intense. It all comes in from their coaching team—all Canadian national team coaches. Tom Arnold is the head coach and is assisted by Andree St. Denis, Mallorie Nicholson and Andrea Keenan. “Our coach, once a week throughout the whole season, has given us a training program,” Oldfield said. The hours are long and for many paddlers the world championships are a one-shot deal. “For the gym it’s an hour-and-a-half to two hours, paddling is always about two or two-and-a-half hours, then when you’re on the water it’s an hour and a half,” said Slassor. “It’s probably 14 hours altogether,” added Oldfield. That’s not including weekend training in Victoria, which Slassor and Oldfield try to make as regularly as they can. It’s prepared them well for the world championship where the team will be competing in three events—all of which take different approaches. “We do a sprint which is 200 metres and under a minute. It’s very fast, right out of the hole and right through,” said Oldfield. The 200m is loved by neither and the team’s weakest event as a whole, Slassor added. The 500m is Oldfield’s favourite, she added. “Then there’s the 2000m. We’re talking 11-12 minutes. It’s cardio, it’s endurance, it’s a lot of strategy because every 500 metres there’s buoys (to turn around) and it’s kind of a free-for-all where you’re not actually racing head to head,” said Oldfield. While long and grueling, the 2000m is Slassor’s favourite. It’s the strategy that intrigues her. The Club Crew World Championships take place in Adelaide from April 1–7. To watch a livestream of the races, visit www.adelaide-dragonboat2016.com.